Wow what a Foodie Pen Pal treat I had this month! The fabulous Anna from The Days When I'm Not A Nurse sent me a summer themed box full of stuff that has Megan written all over it. I don't think she could have nailed this better. The first item that caught my eye was the Red Velvet Pancake Mix. I have to be honest, I immediately thought it was Red Velvet Cupcake Mix. Then my eyes bugged out and I got very excited for breakfast on Sunday morning after my 6 mile run (looking forward to the pancakes, not the run). Then my eyes darted to the little spice container because I saw the word BACON. Thank you Anna - you have NO idea how long I have been wanting to try out Bacon Salt!!!! I think this will be delicious as a drink rimmer for a spicy bloody mary. I may have to add that to my breakfast on Sunday! Next on the list was a Chocolate covered graham cracker with marshmallow filling. JO'S SMORES! Pumpkin Risotto Mix. This will be so good in the fall. I will serve it alongside of Butternut Squash Soup and a roasted pork loin! Anna also got me adorable summer straws. Upon first sight, I knew I had to make myself a Pisco Sour. I make mine w/ Splenda instead of sugar water - keep it a little healthy. One thing about this recipe is how people are afraid to try it since it has egg whites in it. It is a refreshing drink with a Margarita like taste - and I prefer it to the classic Margarita. And yes - I am showing off one of my new Mackenzie Child's Canisters that I received for my Birthday. The large and small canisters didn't make the shot. You know you're getting old when you get overly excited over high end canisters. Anna also sent me a cute jar of honey, but I didn't get the shot. 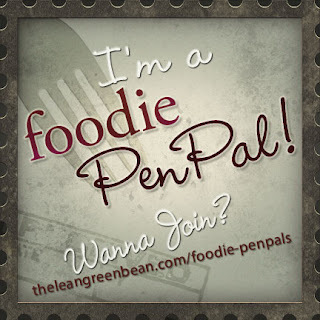 ﻿This was my 4th month of being a foodie pen pal and I absolutely love it. You get to make new friends and get things you normally wouldn't be able to find yourself or buy yourself. Thank you Anna for this great collection! I sent Brittnye from The Healthy Living Chick a fruit themed box. She mentioned her favorite thing to eat was fruit, so I made sure that everything was fruit related, with the exception of the BBQ Pop Chips that I was introduced to last month! wow, you just did the BEST review of a box I've ever seen. :) I'm so glad you liked it!! (and the bacon salt to rim a glass is BRILLIANT! )So happy to have had you this month!